Dutch security conference! It’s called hardwear.io, it’ll be in The Hague during the last week of September, and they have the CTO of Silent Circle/Blackphone giving the keynote. Baltimore’s awesome despite what the majority of the population says, and they have a few hackerspaces. One of them has an Indiegogo going right now to save the space. Want a tour of the space? Here you go. [Fran Blanche] made it on to the Amp Hour. Included in this episode are discussions about the boutique guitar pedal market and the realities of discarded technology that took us to the moon. Speaking of electronics podcasts, SolderSmoke is 10 years old now. TARDIS-shaped guitars are nothing new, but [Gary] from the LVL1 hackerspace in Louisville, KY is making an acoustic one. The neck is, of course, taken from another guitar but the entire TARDIS-shaped body is custom-made. Now do resonance calculations on something that’s bigger on the inside. Think German-made means German quality? [AvE], [Chris], or whatever we call him did a teardown of a Festool Track Saw. It’s a thousand dollar tool that will start to stink in a few years and has bearings that don’t make any sense. Once again, [Afroman] is here for you, this time breaking down electrolyte and the terminology behind batteries. Volts and Amps are easy mode, but what about Amp hours? They’re not coulombs per second hours, because that wouldn’t make any sense. An Amp hour is a completely different unit podcast, where a 1Ah battery can supply one amp for one hour, or two amps for 30 minutes, or 500 mA for two hours. Okay, what if you take two batteries and put them in series? That would double the voltage, but have the same Ah rating as a single cell. Does this mean there is the same amount of energy in two batteries as what is found in a single cell? No, so we need a new unit: the Watt hour. That’s Volts times Amp hours, or more incorrectly, one joule per second hour. Now it’s a question of the number of cells in a battery. What’s the terminology for the number of cells? S. If there are three cells in a battery, that battery has a 3S rating. You would think that C would be the best letter of the alphabet to use for this metric, but C is entirely different. Nothing here makes any sense at all. What is C? That’s related to the number of amps a battery can discharge safely. If a 20C battery can discharge 2200mAh, it can deliver a maximum current of 44 A, with 20C times 2.2Ah being 44A. So there you go. A complete description of something you can’t use logic and inference to reason through. Video below. Update: We have it figured out. We’re bringing the awesome at The Blind Donkey in Pasadena, CA at 6pm this evening. Stop in with your hardware and your war stories. 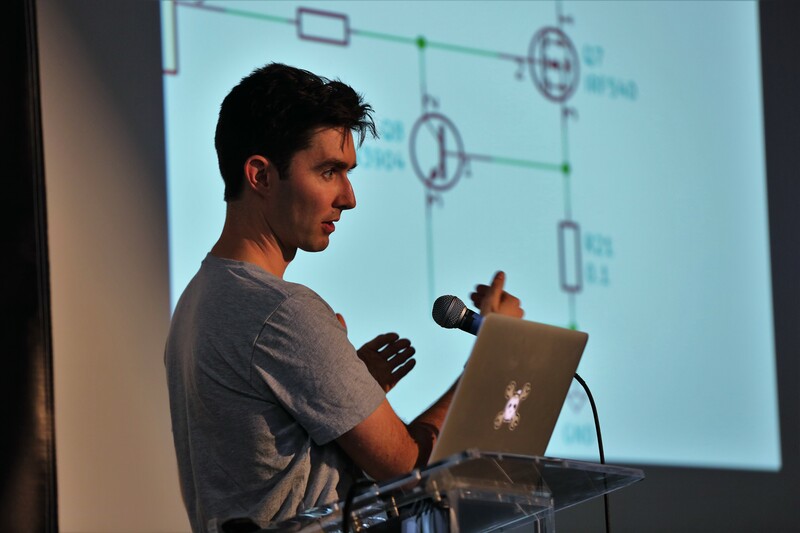 Chris Gammell, Mathieu Stephan, and I can’t wait to talk Arduino hardware hacking with you! I’m getting to meet all kinds of cool people in person this year, and so can you! Well… if you happen to be in Pasadena, California on Wednesday after work and have nothing better to do. [Chris Gammell] — well-known for The Amp Hour and Contextual Electronics — and I are both going to be in town. We’re meeting up for a beer and thought we’d invite you along for the fun. Details are scarce right now. I’m not sure of time or place (other than Pasadena area) so make sure you follow @Hackaday on Twitter and watch for the #HaD_meetup tag Wednesday afternoon for the details. We’ll also update the Hackaday Projects event page at the time. I’ll bring along some swag; you’d better cart along a piece of hardware to show off in return for a t-shirt or stickers. You’re on your own for food and beverages at this one. Wondering what I meant about meeting lots of cool people? In addition to the nearly 500 awesome readers who showed up at The Gathering, I met [Brian] and [Eliot] for the first time. The Amp Hour, a podcast of electronics enthusiasts and professionals alike, just did an epic interview with [Joe Grand]. Along with hosts [Chris Gammell] and [Dave Jones], the discussion runs the gamut of points of interest in the hardware hacking world. The first vignette explores the rise, run, and fall of Prototype This, an engineering-centric TV show that [Joe] did along with a group of various engineers for the Discover Channel. He politely discusses some of the goods and bads of the TV business and how that affected the team’s ability to go into great detail about the projects they were building. From there the guys discuss the development of Hackerspaces through the years. [Joe] has some concerns about the injection of corporate sponsorships in these DIY spaces and what that may mean in the long run. He then talks about the impending release of his 3-year-long laser range-finder project (we’ve seen a project using a prototype of this sensor). The show is rounded out with discussions about hardware fab houses that [Joe] uses and has used over the years for projects like the Defcon Badges (we loved his Defcon 18 badges). It’s a great episode so download a copy and set aside about an hour to listen to the whole show.